The weather was warm and calm; on a beautiful summer night dozens of people were out in the square with their ice cold drinks, chatting loudly and some were dancing their cares away. Pure happiness was in the air. A girl in a pink flare dress came running around the corner, her red scarf flying after her as if she had wings. She rushed through an old wooden door, passing through time and space. Inside the building was warm and colorful, one could smell the sweet odor of wood and wine coming out of the moorish azulejos. On the far right stood an authentic bar with numerous bottles of rioja and jamon iberico hanging down the ceiling. She was looking forward to this night after meeting dozens of friends day and night, a rendezvous with herself only. All she wanted was to experience the flamenco show to the fullest; no talking, without interruption. She entered the room with the waiter leading the way and took a deep breath. The venue was just magical: the historic tiles continued all the way on the walls, shades of terra colors warmed up the atmosphere in a way that reminded her first time in the country- a decade ago… Under very little light, the guests were sitting at Andalusian style tables eating their dinner peacefully. It was 9 pm and she thought to herself how much she loved this late dining and night life custom of spaniards. Sleeping was a waste of time for her kind, the curious one, the wandering soul. She was accompanied to a front row table, that put a smile on her face. It was the best table as far as she can see, all was perfect. Four middle aged loud women sat at the table next to hers, who apparently got divorced and decided to take this vacation to Spain just for pleasure. When she told her brief story about traveling sola – they chanted: You go girl! Good for you! She leaned back on her chair to hang her scarf while trying to end their conversation as the show was about to start. While helplessly trying that, a guy caught her eye at the back. He was gesturing her to come over. She barely heard his words: ” Estas sola? I am dining alone and… Please share my paella if you would do me the honor to accompany me at my table” Or some sort… She replied: “Thank you but no, i’m ok here. ” she truly meant it, no interruption tonight. While she thought she could get away, her neighbor ladies jumped in : “Come on, give it a try! Don’t you see he’s a good looking guy- AND don’t forget to take condoms with you!” A laughter rose from their table as she turned red in the cheeks… He was smiling, looking straight at her direction, just smiling and waiting. He actually was charming- with his shaved head, tiny smiling eyes; you could tell he has been working out, he looked strong. After a few more lines, she finally agreed to join him at the table, still shy and very embarrassed from the previous remarks they could only exchange their names and fortunately the lights turned off and the show started. She could barely drink her glass, thinking to herself: What the hell am i doing here?! She did not touch her food. Though in a few minutes she was hypnotized by the dancers and the music. He leaned over to her ear and whispered: I could dance a lot better than him. “how cocky!” She thought to herself, was this the best thing he could come up with?! Then he continued telling her about his job, his life and his journey through Spain. They walked out slowly, picked a table at a café nearby. Started talking from here and there, time flew by. He was listening to her very attentively, hearing out each and every word. – and i broke his… Real bad… So we were even, she stated. He was impressed by her straight answer, she was bold and brave. He tipped the street artist to play her song again and again. He called after her: Farfallina! He grabbed her arms, held her strong and kissed her in the middle of the street. “Viva la vida, viva el amor!” One shouted into the dark cobbled street. They danced their way into the night as a few late nighters watched them disappear under a street light. 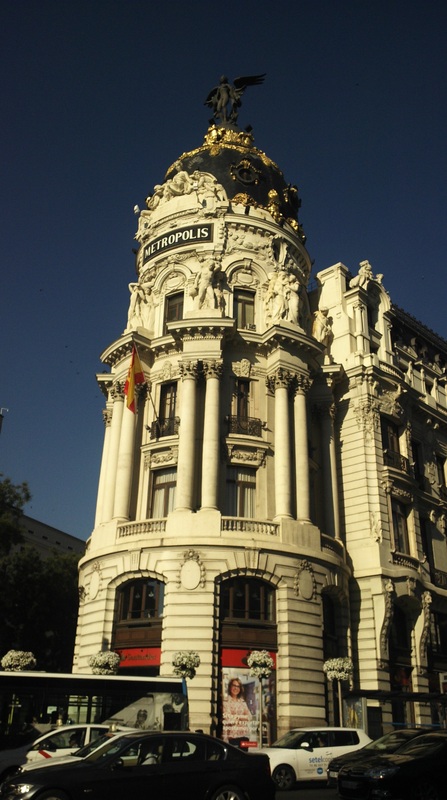 Posted in Yol HikayeleriTagged freedom, freeflow, Madrid, seyahat, travelBookmark the permalink.